Coach McNamara emphasizes team play and hard work and strives to create a family atmosphere for her players each season. While the ultimate destination is a NEPSAC Championship, players are encouraged to have fun and enjoy the journey. Graduates have gone on to play at Boston College, Trinity College, Bowdoin College, Skidmore College, St. Lawrence University, Colby College, Connecticut College, and Merrimack College to name just a few. 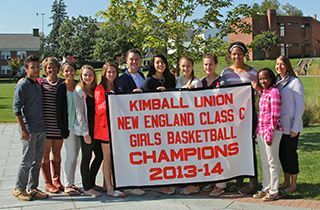 The KUA Girls Basketball program earned their 21st straight playoff berth with the #6 seed in the 2019 NEPSAC Basketball Tournament. The Wildcats had to travel to Hartford, CT to play the #3 Watkinson School, whom beat KUA by a generous 21 points ealier in the season. While we were not able to pull off the upset, the Wildcats showed just how much they have improved and how much better basketball they are playing now vs the beginning of the season. The team fought hard for 32 minutes as the game went back and forth from start to finish. While our 3 seniors played their final game wearing our beloved orange and black, they once again led our team in an outstanding defensive effort. KUA played at home against Holderness School on Wednesday. The first five minutes were back and forth on each end of the court until KUA settled down and found their rhythm. They started to extend their lead in the closing minutes of the first half, outscoring Holderness 26-17. They switched between zone and man defense to keep Holderness from finding the hoop. Maddie Hastings played strong defense and shut down a key player from Holderness. Jenna Santos stayed aggressive on the offensive end, looking to attack the defense and get to the paint. In the second half, KUA increased their lead by 20 points, but Holderness chipped back to within 10 points. However, KUA was able to reopen their lead back to 20 points and run time off the clock, using all of the shot clock on each possession. KUA looks to continue their winning ways this Saturday against Phillips Academy Andover. The success of our girls soccer and field hockey teams this fall meant a late start to the basketball season, as many of our athletes were still competing with their fall teams. So with just 4 practices in three days under their belts, KUA opened the hoop season at home against a big and talented Bradford Christian team this afternoon. While there is a lot of room for growth and improvement, KUA has a lot of promise and a lot to be proud of. The Wildcats were led by the outstanding defensive toughness of senior Maddie Hastings, and the perfect free throw shooting of Maddy Haynes. Haynes finished the game with 20 points and went 9 for 9 from the line. The Wildcats will get one more day of practice before they play 2 more games this week, hosting St. Pauls on Friday evening.